The ACL is responsible for controlling rotational stability of the knee. An ACL deficent knee is unstable for activities involving pivoting, twisting or deceleration and may give way. Our understanding of this ligament and its importance to knee stability has increased greatly over the last 15 yrs. Our ability to treat ACL deficent knees has also improved. ACL injuries once spelled the end of a sporting career , these injuries can now be viewed more optimistically. The majority of ACL deficent knees are unstable in twisting or turning situations. When the knee gives way the joint surface or meniscus may be damaged. Continued damage will result in arthritis. To avoid this you can either avoid certain activities or undergo ACL reconstruction. The deficient ligament is replaced with a graft usually either hamstrings ligament or patella tendon. 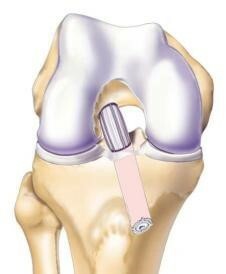 The graft is placed in the knee joint through drill holes in the bone and held with screws. The procedure is done arthroscopically with a small incision to harvest the graft. The surgery involves a general anaesthetic and most patients stay one night in hospital. A good or excellent result for improving stability is achieved in approximately 95% of cases. 90% of patients return to their original level of sport. – Infection : < 0.5%. Deep infection can be a serious problem and may require further surgery. – Stiffness : It is normal for the operated leg to be slightly stiff. Normally < 5 degrees. Some individuals form excessive scar tissue which may require further surgery. 0.2%. Early mobilisation and exercises diminishes this risk. – Graft Failure : No graft is as strong as the original ligament. A big enough injury can damage it. If excessive force is applied to the knee early the graft can stretch and loosen. Approximately 10% of graft do loosen with time..
4% ) , this is about the same incidence as failure of the reconstruction. It has been hypothesised that this is because some people have a weaker than normal ligament in the first place. Blood clots are a rare complication following arthroscopic knee surgery.They are more common in certain population groups. Eg. elderly, obesity,poor mobility, females and those patients taking the oral contraceptive pill. As part of your preoperative consultation Dr Hewitt will assess your risk of blood clots and may recommend further precautions following your surgery eg. Clexane or compression stockings. To achieve the best possible result a prolonged course of rehabilitation is required. In some patients a physiotherapist may be used to supervise this. It is important to not overdo it. A common cause of graft failure is overaggressive rehab before the graft has strengthened. The graft takes 9 months at least to mature. No amount of exercises will speed this up, graft strength and maturity is independent of muscle strength. Day 2: Home , splint , weight bear as pain permits, Movement, ice, compression elevation (MICE). 2 Weeks: Clinic review, full weight bear, co-contractions. 4 Weeks: Aim 0-100. Closed chain only. 3 Months: Increase exercise, cycling, mini tramp, lunges 4 Months : light jogging. 5 Months: figure 8s, change of directions. 9 Months: If all well return to sport. If it hurts or swells then you are doing too much. Office work: As soon as pain allows usually 10-12 days. Driving: When you can walk without a limp and are in control of the vehicle. Usually 3-4 weeks. Standing: For long periods 4-6 weeks. Heavy work: Full squatting, digging 3 months. To keep this information with you, you can download the pdf here.